Was Liberace a woodsy guy? Probably not. But David Saffert had to be. This past weekend David had the honor of performing as Liberace at the wedding reception of Ninkasi Brewery co-founder Jamie Floyd and Lila Bichel. About 30 miles east of Eugene, Oregon is a beautiful outdoor spot called the Oregon Cliff House. Overlooking the McKenzie River, it is breathtaking. Jamie has been an incredible sponsor of ours, most notably this past Christmas when we debuted our "A Liberace & Liza Christmas." 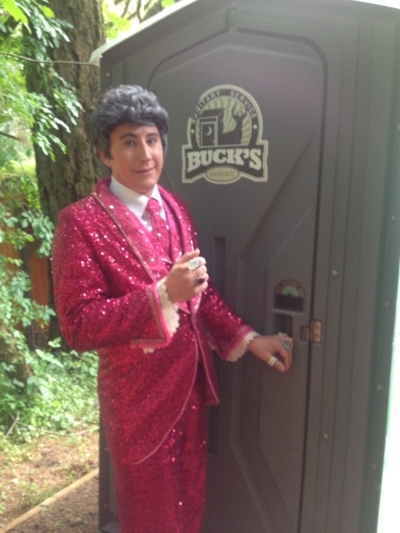 Cheers to the happy couple and we hope you enjoy these 'rare' photos of Liberace in the great outdoors! Jamie Floyd takes the cape off like a pro! The newlyweds look on as Liberace wonders if the microphone clashes with his outfit. Liberace did not read the fine print in his contract. "This star is missing my name."